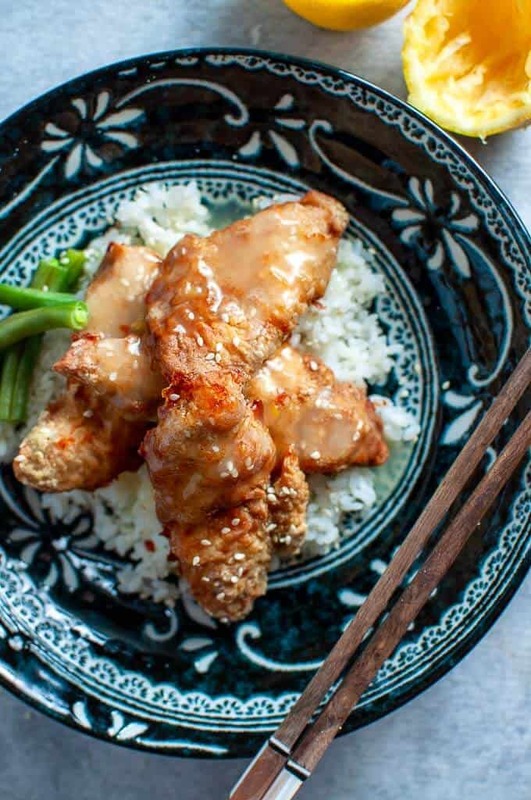 I love these Asian lemon Chicken Tenders. 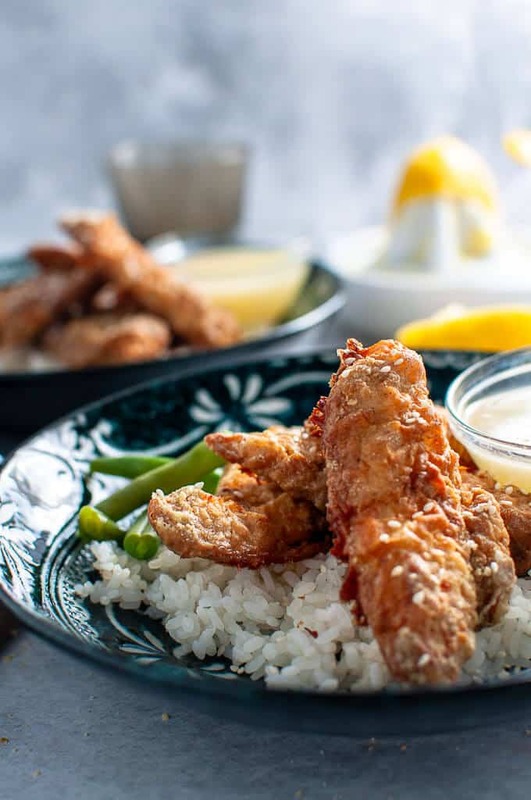 They are a healthier take on traditional deep fried lemon chicken and are baked in the oven until golden and crispy and crunchy, served with a thick tangy lemon sauce over sticky Sushi rice and nourishing green beans. 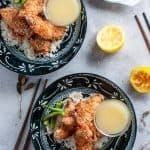 My husband had been making Asian lemon chicken for years, but it wasn’t the healthiest of recipes. It had white sugar in it to make the sauce sweet and sticky, the chicken was battered and deep fried, and it was delicious. Oh Yes. I wanted to eat it every week. But, in reality that would not have been good for my health or my waistline. So, this is my new and improved recipe that I call clean eating Asian lemon chicken. It’s baked not fried and there is no batter in sight. Instead just a quick marinade of the chicken and a light coating of cornstarch before baking. The lemon sauce contains no refined white sugar and instead I used 2 tablespoons of pure raw honey straight from the beehive. Did you know normal Asian Lemon Chicken can contain upto ½ a cup or more of white sugar? No wonder it tastes so good cause that stuff is addictive. 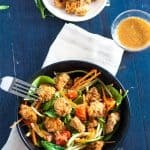 Some Other Clean Eating Asian Chicken Recipes You Might Like: —>>> Easy Chicken, Kale and Noodle Stirfry, Clean Eating Thai Green Curry, Deliciously Authentic Clean Eating Butter Chicken and this super simple Thai Cashew Nut Chicken. 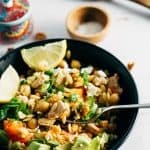 How Do You Make Healthy Asian Lemon Chicken? The trick to making a healthy Asian lemon chicken is to decrease the amount of fat used, and the amount of sugar. When baking the chicken tenders, use a heavy based baking tray if possible. 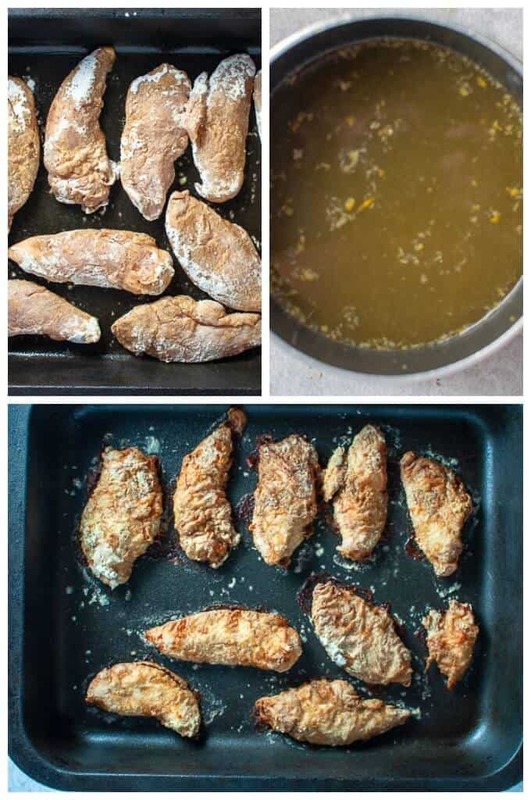 Coat your chicken tenders in the marinade and refrigerate for 30 or so minutes, shake off the marinade, dip into cornstarch, pop into the baking dish and spray all over with Olive Oil. Then the magic happens. 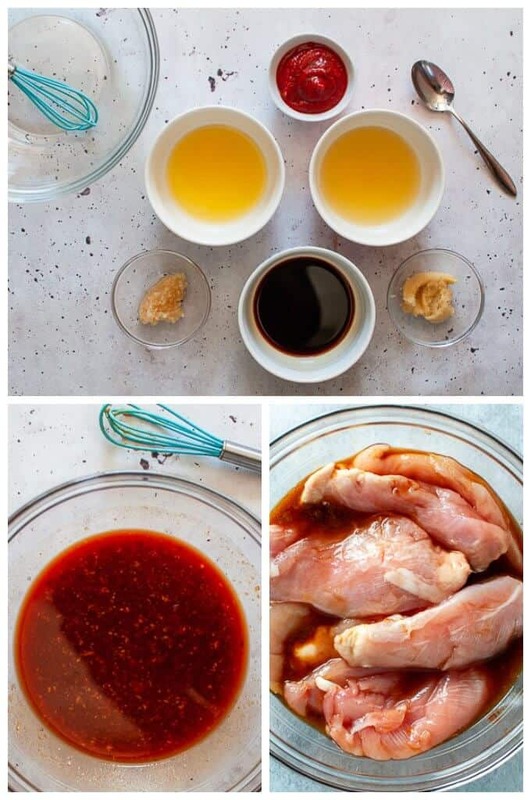 As the Chicken tenders are cooking in the oven, with the marinade for flavour, the cornstarch, and the spray oil, it creates a similar effect to deep frying, but without all the saturated fat content. 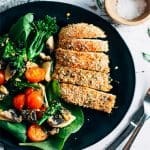 How Do You Make A Thick Lemon Sauce For Chicken? This is the fun part. Add the chicken stock, Chinese rice wine, raw honey, lemon juice and lemon rind into a saucepan and heat on high. Just as it starts to bubble, that is when you need to add the thickener. The thickener consists of cornstarch and tapwater, mixed together to create a slurry that when added to the super hot lemon sauce, creates a reaction and takes the thin and runny lemon sauce and turns it into a thick and luscious lemon sauce. TIP: The lemon sauce must be very hot (just bubbling, not boiling) before you thicken it. If you attempt to thicken the sauce and it is not hot enough, the thickening process will not occur. What’s a Good Side Dish For Lemon Chicken? Personally, I love this dish with sticky rice. I buy sushi rice from the supermarket and cook it in my rice cooker just like normal rice. Sushi rice is perfect for this recipe as it can hold the lemon sauce without it dripping through. I find it’s also a little more filling than say Jasmine or basmati rice which is great because it means you eat less. As much as I love my clean eating Asian lemon chicken tenders, I always need some greenery with my dinner and my go to vege is often a big bunch of steamed green beans, also perfect for dipping into the lemon sauce. Other veges that would also work are carrots chopped into sticks then steamed, steamed bok choy, or steamed Zucchini cut into oblong discs. TIP: This lemon sauce would also work well as a finishing sauce with grilled or lightly pan fried chicken breast, salmon or firm white fish. 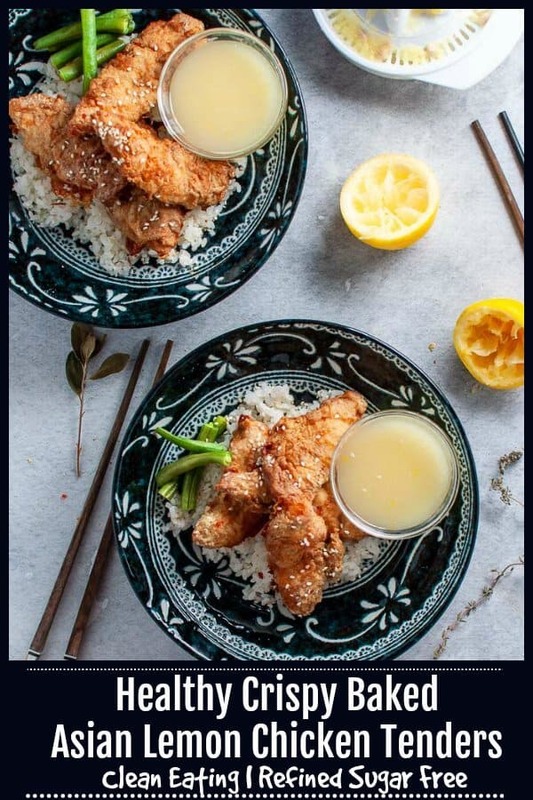 The great thing about this healthy Asian lemon chicken dish is that it is so simple but looks impressive and it tastes authentic too. I am so much happier now that I have this healthier version. Clean eating lemon chicken is now on our menu much more regularly because its quick to make, there’s no fussy ingredients and it feels like you’re eating an actual Chinese shop lemon chicken takeaway, except you’re not. Instead I’m eating a much healthier version that isn’t going to spike my sugar levels and will keep me fuller for longer. 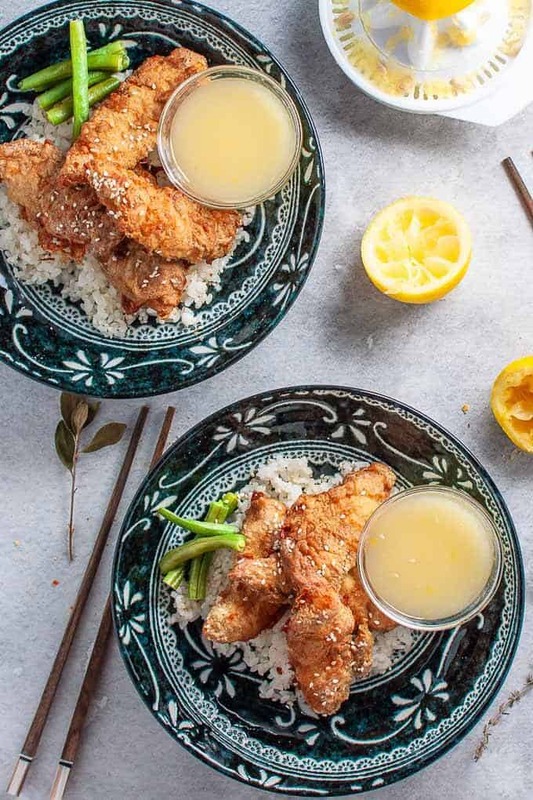 Asian lemon Chicken Tenders that are a healthier take on traditional deep fried lemon chicken. The sauce contains no refined white sugars and the chicken is baked in the oven until golden, crispy and crunchy. Preheat oven to 180 degrees C. or 320 degrees F.
The Chicken: in a large bowl, add the egg, soy sauce, 1 tablespoon of Chinese rice wine. Whisk together with a fork, and add chicken tenders. Make sure tenders are coated in the marinate, cover with plastic wrap in put in fridge for 10 minutes. In a large bowl, add ½ cup of cornflour and ½ teaspoon Chinese five spice powder. Mix to combine. Remove tenders from fridge after 10 minutes. One at a time, shake of excess marinate, and coat with flour. Repeat until all tenders are done. Bake for 15 minutes. Meanwhile, cook the rice as per packet instructions. Prepare the Lemon Sauce: in a small saucepan over high heat, add the lemon juice, rind, chicken stock/broth, honey and 1 tablespoon of rice wine vinegar. Stir through for around 3 to 5 minutes until hot. Veges: Use a saucepan and steamer on the stove to cook the beans and snap peas or microwave in small bowl of water for a few minutes. 10. Serving Up: Place the chicken on top of the rice with greens to the side. Drizzle the lemon sauce over the top. Nutritional information includes the chicken, lemon sauce and a serving of sticky sushi rice and green beans. Thanks! this is one of my favourites.